Could Your Cuckoo Clock be Worth Money? Cuckoo clocks aren’t like your traditional run-of-the-mill time-tellers. They are fun, vibrant and eclectic pieces that joyously announce the passing of another hour. And what a festive occasion it is as a little bird pops out of its hole, singing a melody to greet those nearby. 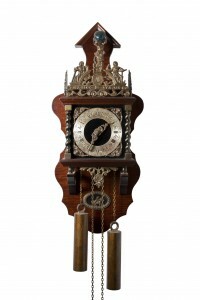 The cuckoo clock was first invented in the middle of the 18th century in Germany’s Black Forest. Although modern day replicas are aplenty, antique cuckoo clocks are so precious that they can easily fetch thousands of dollars. Perhaps you have a cuckoo clock in your home, whether it’s proudly hanging on the living room wall or buried deep in the attic. But how do you know if yours is worth any money? Could yours be a vintage model or is it a Target knockoff instead? According to the experts, there are ways to identify whether your cuckoo clock is of any value. Read on and you may find you have a true gem on your hands! Like all things, the better condition it’s in the more it’s going to be worth. Cuckoo clocks that have damaged carvings or cracked wood will not fetch the same kind of money that a well-preserved one would. Broken clock hands, busted mechanics and a bird that no longer sings are serious threats when it comes to antiques. Check the condition of your beloved clock and look for ways to either fix deficiencies or preserve the item from getting worse. Some of the world’s most valuable cuckoo clocks have one thing in common: All of their accompanying designs are highly-detailed and capture all of the wonderful things that take place in a Black Forest setting. Intricate carvings will depict ivy, flowers and a variety of forest animals. Your cuckoo clock may even contain ornate figurines of children playing amongst the trees. Germany’s 18th century clockmakers were known for their attention to detail. If your cuckoo clock contains such intricacy, it may be worth much more today than when it was first purchased. Antique cuckoo clocks are primarily made of Limetree (or Linden). This tree can be found everywhere in the Black Forest, making it the material of choice amongst Germany’s clockmakers. The wood carves very nicely and has a smooth texture that is perfect for decorative pieces. But when it comes to the mechanics of the clock, all pieces must move with lead weights. These weights look like tiny pine cones and are not found usually found in modern day cuckoo clock replicas.